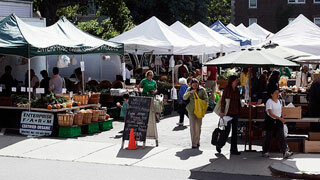 You are currently browsing the category archive for the ‘farmers’ markets’ category. July 20: Wind Hill Farm as part of a visiting chef demonstration. Sept. 15: Books, Bites, & Bordeaux: Fundraiser for the Welles-Turner Library Second Century Fund. I’ll be speaking and signing/selling books. All profits benefit the Second Century Fund. Check your calendar. These will be fun and interesting events with lots of local food and seasonal specialties!